to its factory in Oakland, California and urges you to make a complete inspection of the various processes by which it turns high-grade raw materials into outstanding motor cars. There are many items of Durant construction which do not appear on the surface yet which add thousands of miles to the life of the car. The guide who accompanies you through the modern plant will he glad to explain these as well as to answer any other questions regarding the manufacture of Durant cars. We want you to enjoy your visit to our factory and we know you will find it valuable when you buy a car. "To know a Durant is to own one." The system of manufacture employed in all Durant factories is that found most economical and efficient throughout the automotive industry, namely, the "production line and sub-assembly" plan. Visitors to the Western Durant factory located in Oakland enter the plant through an area where engines and body parts are received from the fabricating plants. The first glimpse of actual manufacture comes in the group of sub-assembly units where the side-frames, tops and floors of closed bodies are put together. Those familiar with construction methods will note that only most approved methods of joining are used, mortises and tenons, bolts, screws and glue being the main reliances. They will also be struck by the large use made of jigs. Every portion of a Durant car is fabricated in a jig or framework which holds the various pieces in proper relation while the workmen fasten them together. This assures absolute interchangeability. Consequently accurate fitting is preserved everywhere and the work of assembly is expedited making for efficiency, for ease of repair in event of accident and for economy. The body assembly line starts with a body frame, glued, screwed and bolted together in a huge frame-work. This frame grows as rapidly and almost as mysteriously as the mango tree in the famous Indian trick. One man lays bottom members in the frame work, others add side frames and door pillars, another lifts the top frame into place and workmen swarming over it insert and tighten the necessary bolts, drive home the screws and fit the tenons into the mortises. Coming out of this framework, the body frame is a dolly which rolls on the rails of the production line. Much metal is in evidence in the way of braces, ties and so forth. Observation reveals, too, that all the wood used is hardwood, mostly maple or Oak, and that wherever wood and metal touch, insulation is provided to prevent the development of squeaks from friction even if abuse should rack and loosen the body frame. With electric screwdrivers, air-driven wrenches and electric drills the workers at the next few stations add various wooden parts to the body frame. A few stations down the line, the first of the outside metal sheathing parts is added. This comes from an interesting sub-assembly group off to one side of the main production fine. Here electric spot welding machines fasten together the pressed sheet steel parts almost more rapidly than an upholsterer could tack wooden slats together. The welding machine operator presses his foot on a treadle; the machine closes down, there is a spark and the weld is made. This method of construction prevents development of squeaks from friction or rattles between different pieces of metal. The body sheathing parts, one at a time, are added to the wooden frame and fastened. Pressed metal pieces, the exact shape required, are attached to the door posts. Each is slotted for addition of hinges and door catch later. At some stations, where men must work near the bottom of the body, air hoists lift the dolly and its partially-assembled body frame up so the assemblers can reach their work conveniently. All along the line, special-shaped clamps for holding the body pieces accurately are suspended on cords and pulled down from above as needed. Counter-weights carry them up out of the way when they are not in use. All along the line the visitor will have observed men with blue chalk occasionally marking various parts of the body-frames. These are inspectors, marking portions of the product that need further attention. When the doors have been put in, these men come further into prominence. They try each door for ease of opening and accuracy of closing; if the catches do not take hold as they should, if the buffers are not right, if the metal checks which keep the doors from opening too wide and damaging the hinges are not correctly adjusted, the blue chalk mark calls attention to the matter and workmen at later stations remedy it. The inspectors who check the smoothness of the body are especially liberal in the use of the blue chalk. Faint roughnesses in the metal, too slight for the layman to notice; slight depressions, minor elevations, are all marked by them. So particular are they that the bodies are all washed down with gasoline before these men go to work on them. At the next station men with fine files smooth out the rough spots and work down high places. Others buck up low places. Still others, with cloth buffing wheels, put a fine polish on the filed spots. The door department lies at the end of the closed body production line. Here the fabricated wooden frames of the doors, mortised, screwed and doweled together, are covered with smooth pressed metal pieces and a final outside sheathing is fastened onto the frame by crimping with an air hammer. On the opposite side of the body department from the closed body line is the "open body line" where the bodies of touring cars and other types are turned out by methods similar to those already seen. While open cars are no longer the vogue in this country, demands from foreign countries keep this line operating at high speed. This line has its own door manufacturing unit, like that of the closed body section. One unusual feature of these doors is the long one-piece hinge which is used, this can never get out of line. The bodies of Durant cars are lacquered, but the wheels, fenders and chassis are enameled. Both lacquer and enamel are baked on. As the bodies arrive in painting department, they are washed down with gasoline, wiped off and sprayed with an air jet. This leaves them in absolutely clean condition, ready for the lacquer.They are then rolled on dollies into a booth where a priming coat is applied with an air brush. At this and all other paint booths the visitor will notice large exhaust pipes and feel a draft toward the booth. This is caused by large fans which draw the paint and gasoline vapor up into the booth, away from the workmen, and discharge it outside, thus protecting the health of the employees. As each primed body rolls out of the booth on its dolly, an endless chain engages the dolly and draws the body into a long oven, where electric heaters subject it to a temperature of 280 degrees for about an hour. Other workmen add a glazing preparation to smooth down any spots that need it and the body proceeds through another oven, getting another hour's baking. Experts, with sandpaper so fine it feels smooth, rub it down, eliminating all irregularities and providing an absolutely smooth surface for the lacquer. All this time it has been moving along, drawn by the endless chain. Now it enters the lacquer booths, where workmen with spray brushes give it four coats of color. They work on one side at a time, one man's work drying while his mate is painting the opposite side. Adhesive tape, oilcloth and some paper are used for masking parts of the bodies when two or more colors are to be used, so that the air brushes will not cause the colors to overlap Each body has directions chalked on its dash regarding the paint scheme and each no matter how the bodies come along the line, the correct color can be applied to each without loss of time. When all the lacquer is on, the bodies are given a short additional baking, rubbed down and polished. This is all hand work and forms the foundation for the lasting, lustrous finish which is characteristic of Durant cars. Inspectors check the color on each car, scan it for irregularities and mark it for retouching by a "spotter" if it does not appear uniform all over. Hand-workmen touch up the door edges and the floorboards with black paint. "Stripers," using brushes of peculiar shape, add the stripes on the sides; "finish stripers" put on the narrow relieving lines beside these and the body goes to a special crew whose duty is to tighten every nut and screw in it. This is an unusual and extra precaution to insure the body against developing squeaks and rattles. By thus going over everything while the wood members of the body are thorough dry from their long baking, the tightest possible grip is assured to everything. The cutting department is one of the most interesting in the plant. Here as many as fifty layers of velour or other material are laid out on tables sixty feet long, marked off with tailor's chalk and then cut, all fifty at once, with electric knives. No leather is cut this way, however; that is cut by experts, who lay out the patterns on each hide to make sure that material suited for the different pieces is obtained, and any bad spots avoided. A whole battery of sewing machines, operated by women, fasten the various pieces of upholstery together. These machines bind heavy felt pads stitch leather and burlap together and do other things which will surprise, the woman visitor. The cut and sewed upholstery units are distributed, each to its proper station, all along the upholstery line, which occupies the front of the second floor of the main factory building- The bodies are hauled along by an endless chain while the workmen add different pieces of upholstery. The first to go in is the head lining. Side panels, velour strips along the doors and seats, built up on an interesting subassembly line, follow. Burlap is stretched over the top, tacked tight and cut to shape. The other top covering follows. Skilled workers add a binding which conceals the edge and also conceals the tacks with which it is fastened down. The hardware men add the chromium-plated fittings. Glaziers, drawing their supplies from truckloads of accurately cut glass from the Durant cutting plant, insert rear windows, windshields, quarter windows and door glasses. Instrument boards are fastened in place and the finished body rolls out beside a well 'in the floor, ready to be dropped down on a completed chassis below. Before going downstairs to see the chassis assembly line the visitor may inspect the enamel department. This department is reached through a storage area where thousands of fenders, fender braces, rims, small fittings and other parts are stored in orderly piles or placed in bins. Off to one side, in a group of small booths, hoods are sprayed with primer and color, rubbed down and baked. The color treatment given them is similar -in all respects to that given the bodies, but the baking accorded is longer, to protect the color against clipping or blistering under the greater heat to which this part of a car is subjected. The fenders and other parts are subjected to the same cleaning as the bodies, dried, and then hung by metal rods on a traveling frame which carries them down into the first enameling vat, through another oven and out. This produces a hard, lustrous, jet-black finish. Beyond the enamel department is the glass-cutting Plant Formerly all glass came to the factory ready-cut; now it comes in great sheets which are cut to Proper size and run through a machine which automatically grinds away the sharp edges. Workmen bevel the comes and inspectors check the cut plates for scratches. When one is found, it is polished out with water and rouge. No scratched or imperfect glass is allowed to leave the department. The frame of a Durant car is of heavy steel and is unusual in that it has five cross-members. Visitors can see workmen at "bulling machines" fastening the running-board brackets to the side members and building up the cross-members. These machines are cold-riveters, worked by air pressure, which clamp the pieces together and squeeze the rivets down on them under many tons pressure. The assembly of the cross and side members into a complete frame, however, is done with hot rivets. The pieces are put in a jig, red-hot rivets inserted in the necessary holes and a workman with a pneumatic "gun" forms the head on the rivet. When the rivet cools the pressure exerted by it is increased many times, forming an absolutely permanent, squeakless joint. The completed frame starts down the chassis assembly line on another of the familiar moving chains. Workmen add rear axle assembly, front axle assembly and brake-drums, gasoline tank, tire-rack, transmission, drive-shaft, brake-rods and other parts so rapidly the visitor is almost bewildered. The various items are brought out from their sub-assembly lines at the side, or from storage, slipped into place and bolted home so rapidly that one is not fastened down before the next is being added. When almost complete, the chassis is sprayed with enamel and sent down an incline to an oven beneath the floor for a baking. Still on its endless chain, it emerges an hour or so later and some hundreds of feet distant to be gone over by a corps of inspectors. Meanwhile, on a separate line off to one side, skilled mechanics have been taking engines from stock, inserting the clutches in the fly-wheels, installing the starter, generator and ignition system, checking the valves and preparing them for operation. Now the engines come over to the chassis line and are lowered into position. Then engine shaft and transmission shaft and transmission are lined up and the universal joint put in. Headlamps are brought from one side, set in place and wired up. A battery, already charged, is set in place. The body is lowered by an air hoist from the floor above, the bolts already inserted in its sills, ready for attachment to the frame. The radiator is then added. In the wheel department, the sturdy artillery wheels have the brake-drums attached, the tires put on and the tubes inflated. The drums are- trued to within .003 inch by an ingenious concentric grinder which makes certain that the brakes will take hold evenly and smoothly. Wheels are lubricated and attached to the chassis. The wiring is completed and the instruments coupled up. Measured quantities of gasoline and oil are run into the car, its radiator is filled and it is driven out for engine tuning and road tests. Durant cars are shipped from this factory to all parts of the West, to Hawaii, the Philippine Islands and the Orient. For shipments abroad, the closed cars are crated, but touring cars are shipped partially disassembled. Domestic shipments are made of complete automobiles in standard railway automobile cars. An ingenious system of blocking up two of the cars and running the others partly under them permits a single railroad car accommodate four Durants. To get them into the car, a special jack, mounted on pneumatic tires has been devised. 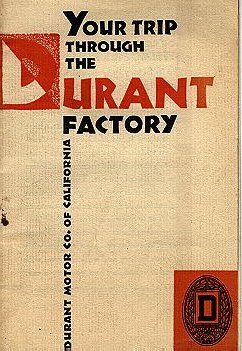 The visitor at the Durant factory cannot but be impressed with the cheerfulness of the workmen, the interest in their work and the extraordinary speed with which they perform their duties. The company looks carefully after their health by providing good light, proper heat and plenty of good, fresh air. The ventilation system is especially devised to draw away immediately the fumes of gasoline and lacquer so that the workmen do not breathe them. A highly-equipped first-aid station is maintained in the factory, with a nurse always in charge and a physician on call. This first-aid station has everything that could be required in event of accident, including an operating table. The company maintains a cafeteria where excellent food is provided at moderate cost for the employees. As a result of this fair play on the part of the factory, Durant employees are known far and wide as one of the most loyal groups of workers affiliated with any manufacturer in the world. "Worlds Finest Low Priced Car"
"Most Sensational Six Ever Built"
The tour program was graciously donated by Mike Larsen to the Oakland Durant Museum Project.